BELVOIR’S THE WILD DUCK, WRITTEN BY SIMON STONE WITH CHRIS RYAN “AFTER HENRIK IBSEN” AND DIRECTED BY STONE, IS A POWERFULLY ENGAGING WORK, TAUTLY SCRIPTED, SUPERBLY ACTED AND COMPLEMENTED BY AN AUSTERE DESIGN THAT EVOKES A ZOOLOGICAL INVESTIGATION IN WHICH WE WATCH HUMANS CAGED BY OBLIGATIONS AND TABOOS LITERALISED AS A LARGE GLASS BOX FURNISHED WITH NOUGHT BUT CARPET AND, ABOVE, A DIGITAL READOUT OF THE DAY OF THE WEEK AND TIME. Although Stone uses the title of Ibsen’s 1884 play, his is quite another Wild Duck. He cleverly fast-forwards the plot to the present, pares back much of the original, invents new scenes and thins out the melodramatics (replacing them with some of his own, not least musically). In some ways Stone gets to the essence of the original but, finally, cannot retain its gravitas or its cathartic power. His play is moving, but that’s another matter, and even then is undercut by a lamentable final scene in which, some time after the death of their daughter, the grieving parents meet but fail to regain their relationship. Ibsen with apt bluntness, reminiscent of Puccini, didn’t bother with such a coda. Stone sticks broadly to the plot of the original while reducing its sociological density. There’s a narrower range of characters and social types, and less emphasis on status, work and the debate about moral idealism. Ibsen’s family fears poverty—the photography business is not faring well; the need to keep working is part of the stage action. In Stone’s version, the pressure is mildly present but doesn’t become a key issue—surprising in today’s volatile economy. But Stone is not Ibsen—the psychological drama is more important for him than the social forces that frame it and which are so essential to Ibsen. It’s a big difference. The stripping back similarly reduces the complexity of the original characters. Hjalmar, the husband, is played by Ewen Leslie with a restless, nervous energy, repeatedly bouncing a tennis ball, rolling on the floor, physically playful with his daughter, easy-going. The fond family scenes with overlapping dialogue establish an idyllic state. However, unlike his forbear there is little of the self-aggrandisement, self-pity and moments of irritability that anticipate Hjalmar’s subsequent inability to handle the revelation that his wife Gina (Anita Hegh) was once the lover of Werle (John Gaden), the local works owner and merchant, that his daughter (Eloise Mignon) is Werle’s, not his own, and that Werle had subsidised the set-up of the photography business and the salary of Hjlamar’s ruined father, Ekdal (Anthony Phelan). Leslie’s fine performance and Stone’s writing compensate to a degree, but Hjalmar’s weakness simply becomes a given when the crisis hits. More problematic is the characterisation of Werle’s disaffected son, the meddling moralist Gregers (Toby Schmitz) who suspects his father drove his mother to suicide and betrayed Ekdal. He soon discovers the truth about Werle and Gina and sets out on a relentless crusade to liberate Hjlamar and family from a life of lies. Schmitz’s Gregers is icily remote, with a physical rectitude contrasting with Hjalmar’s casual bearing. His best scene, one of Stone’s inventing, is with Leslie, when Gregers opens up, revealing his failings in love. Later he simply doesn’t have the weight of Ibsen’s creation. In two scenes in the original he attempts to persuade Hedvig to kill her wild duck as a sacrifice to appease her alienated father. In these moments Gregers’ insensitivity and, worse, moral irresponsibility, are frighteningly evident. But his force is not sustained in the Stone version. A significant reason for this is Stone’s updating of Hedvig—she’s more intelligent, bold, ambitious and already knows that she is going blind (a condition inherited from Werle). A modern child on the edge of adolescence, Hedvig decides of her own volition to kill the duck with her grandfather’s gun—she doesn’t need Gregers’ rhetoric as a prompt. Mignon is an excellent Hedvig but a more complex exchange with Gregers would have allowed a greater sense of someone on the borderline between child and adult—the decision to kill the duck comes too easily. (In the original she takes up Gregers’ proposal at first, but repudiates it, if momentarily, at their second meeting.) The outcome is a reduction of Gregers’ role as rigorous engineer of destruction in this human laboratory. In the original he’s subsequently deeply shocked, such is his naivety, when the family falls apart instead of building a new life based on truth. A foil (Doctor Relling in Ibsen) or some other challenge to Gregers’ moral fundamentalism would have been welcome in Stone’s version. The character closest to the original is Ekdal, a former military man, forester and businessman who went to jail for illicit property dealings, shaming himself and his family. Emotionally damaged, sometimes barely present and haltingly articulate, at other times alert and observant, Ekdal has created a refuge in Hjalmar’s attic where he houses (and shoots) rabbits and birds. In a very funny, if foreboding scene, he teaches Hedvig how to load and fire the gun with which she will inadvertantly kill herself. Stone has invested Ekdal with characterful language (“I’m as full as a fat girl’s sock”), insights (“Not much of the forest left—it’ll have its revenge”—words almost straight from Ibsen), amusing recollections (playing The Tempest’s Miranda in school) and anger over Hjalmar’s behaviour (“Everyone’s got a story like this. It’s as old as the hills.”). 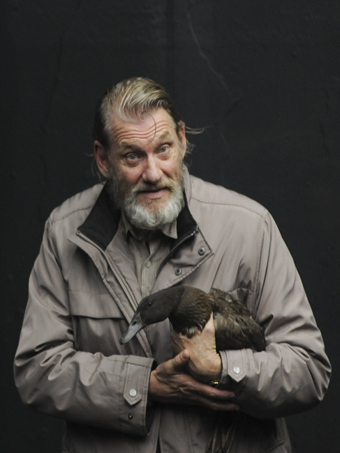 Anthony Phelan’s performance as Ekdal is one of the best seen in Sydney in recent years—richly expressive and detailed, drifting in and out of himself, deeply present, fondly cradling the wounded duck, naturally pacing his delivery between its quacks, the actor’s characteristic gravelly rasp enhanced by intimate radio-miking. John Gaden as the pragmatic Werle—accepting his imminent blindness but eager to move on into a new marriage, to smooth relations with his son and those he feels obliged to assist—is quietly effective; the scene in which he and Ekdal meet, both men disoriented, is particularly touching, age taking them beyond bitterness or blame. Anita Hegh plays Gina with the requisite ease in the beginning, then denial and finally shock at Hjalmar’s bitter response to her long-ago failings. As with Hjalmar and Gregers, Gina’s role is reduced in this version, even more severely, in terms of class, language and coping with her overly sensitive and ineffectual husband. However Hegh conveys the visceral effect of abandonment in her absolute collapse and later in a brutal tussle with Hjalmar. Her determination not to return the marriage does allow a rare show of strength. While, for the most part, I was swept along by the tide of Stone’s brisk, vivid scripting, deft characterisations and the production’s potent sense of immediacy (the glass walls and radio-miking were only initially distancing), in the end I felt half satisfied, moved but not, admiring but critical, impressed but not awed. On its own terms, Stone’s The Wild Duck works well and has won praise from reviewers for revitalising the original, but the writer-director has set himself a formidable challenge—to remake rather than interpret a classic play. It’s ambitious—the outcome must be tested against the original. I’m not suggesting that Stone reproduce more of the original play than he’s already done. I was struck by his inventiveness—new scenes, a modern Hedvig, a degree of topicality. But I wanted him to go further, to be more ambitious, give his characters more complexity and dynamism, achieve a greater sense of our lives now—to match Ibsen. Why else would you create a variation on a great play? Belvoir’s The Wild Duck confirms Stone’s directorial and writing strengths, abetted by fine actors (with outstanding performances from Phelan and Eloise Mignon), Ralph Myers’ complexly simple set and Niklas Pajanti’s stark lighting. But, inspired by, adapting and updating Ibsen, Stone has not matched the strengths of the original play in his short, compact variation. His play’s embracing immediacy cannot, in the end, disguise its inclination to melodrama and a certain thinness of conception. That said, it’s a production to be seen and debated: the rewards are many.